It all started with a Special Project: Solve a mystery in your own life. For seventh grader Bethesda Fielding, one mystery is too tempting to ignore. She’s convinced that her mousy Music Fundamentals teacher is hiding a secret life. But no one is prepared for what she discovers. Ms. Finkleman used to be . . . a rock star? Soon the whole school goes rock crazy, and a giant concert is in the works, led by none other than timid Ms. Finkleman! But is the case really closed or could there be even more to the story of Ms. Finkleman? 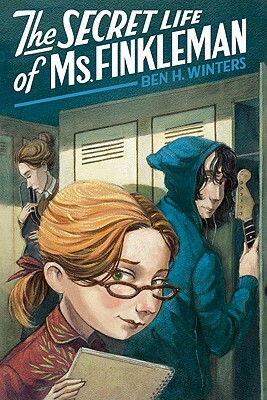 With the help of her rock-obsessed classmate, Tenny Boyer, Bethesda won’t stop until she solves this mystery once and for all! Ben H. Winters is an author and educator who has written plays and musicals for children and adults, as well as several books in the bestselling Worst-Case Scenario Survival Guide series. He is also the author of The Secret Life of Ms. Finkleman, Bedbugs, and the parody novels Android Karenina and the bestselling Sense and Sensibility and Sea Monsters. He lives in Indianapolis.